This year is full of magic when it comes to the Wizarding world. If it's not the Cursed Child it's Fantastic Beasts. I was recently invited to a local premiere of the film and sent my brother in law who is the biggest fan I know. He kindly wrote a review of the film, giving you a bit of an insight into what to expect in this film. 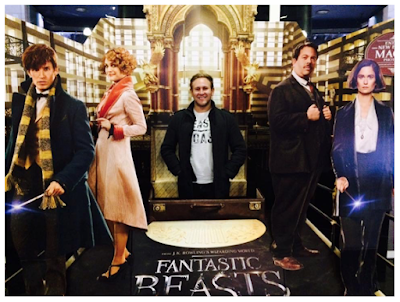 If you’re anything like me and loved the Harry Potter films, then you will have absolutely no trouble falling in love with Fantastic Beasts and where to find them. I must admit I was a little sceptical at first, as unlike the Potter series, this one is set in New York in the 1920’s - but opens up a new Wizarding world that will undoubtedly leave you wanting to explore more. The Wizarding world in America is a little different to what we’re used to seeing on the big screens, so prepare to watch the movie with an open mind. There is a stronger divide between the Wizarding world and “No-Maj’s” (which are the American version of muggles) and the storyline dances around the threat of exposure like the previous films used to. The title of the movie is a little misleading, as the loss and subsequent finding of the magical beasts isn’t the main storyline in this film. The film actually introduces you to a new dark and ominous threat with reference to a few characters we have come across before, that will no doubt pan out into a few more exciting sequels. With that said, you will not be disappointed with the beasts themselves. It’s the magical equivalent to a David Attenborough documentary. I guarantee you will love to learn about the new critters and laugh over their eccentricities throughout. If you haven’t already booked your tickets, I’d recommend you go online right away!